Our Diagnostic Medical Sonography (Ultrasound) program is designed for individuals to receive the technical skills and training needed to become an ultrasound technologist. Many choose this program because they like the variety of patient care offered by the ultrasound field, and want the well-balanced combination of support and flexibility offered by American Institute’s hybrid training. Our instructors are online with you in real time, so you can get your questions answered from the comfort of your own home during your online classes, and then complete any coursework at your leisure over the next week. And, if there’s anything you don’t understand, you’re always welcome on campus to practice and work with the instructors to be sure you are comfortable with the concepts you’re learning. Our hybrid training approach combines hands-on lab work with online theory classes to give you the flexibility you need for your busy schedule. In the on-campus lab, you’ll learn to generate and recognize normal ultrasound images using actual ultrasound equipment to practice and develop your skills. This program prepares students to sit for the Abdomen (AB) and/or Obstetrics and Gynecology (OBGYN) specialty examinations through the ARDMS. This program includes vascular training as well as muscular skeletal exposure, which provides students a wide range of options for specialization after completing their training. During Term 6 (the final term) students are eligible to sit for the SPI exam (Sonography Principles and Instrumentation) which is half of the ARDMS exam. Upon graduation, students will be eligible to sit for the specialty ARDMS exam of their choice. In addition, American Institute reimburses students for the SPI exam if taken during Term 6 and one specialization test if taken within 90 days of graduation. 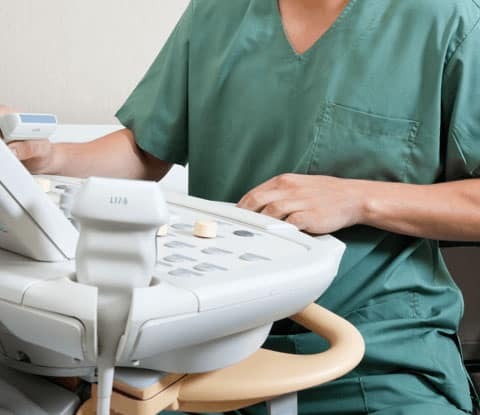 Diagnostic medical sonographers use special imaging equipment that directs sound waves into a patient’s body (in a procedure commonly known as an ultrasound, sonogram, or echocardiogram) to assess and document various medical conditions. 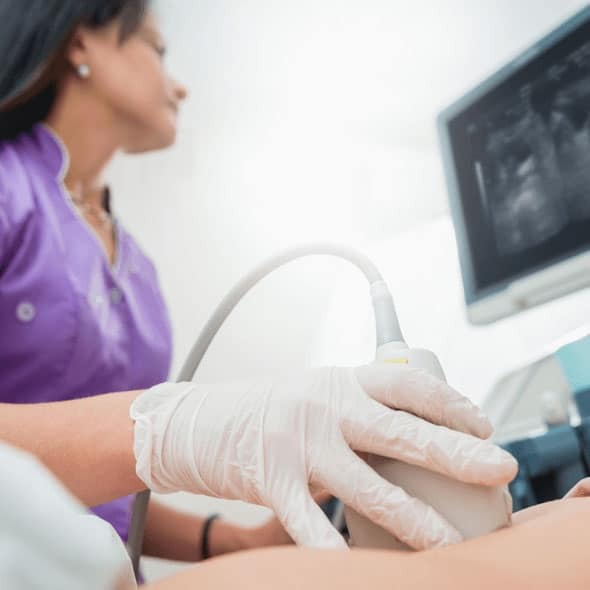 Abdominal sonographers specialize in imaging a patient’s abdominal cavity and nearby organs, such as the kidney, liver, gallbladder, pancreas, or spleen. Breast sonographers specialize in imaging a patient’s breast tissues. Sonography aids mammography in the detection of breast cancer. Breast sonography is also used to track tumors in breast cancer patients. Musculoskeletal sonographers specialize in imaging muscles, ligaments, tendons, and joints. Neurosonographers specialize in imaging a patient’s nervous system, including the brain. Obstetric and gynecologic sonographers specialize in imaging the female reproductive system. Many pregnant women receive ultrasounds to track the baby’s growth and health.